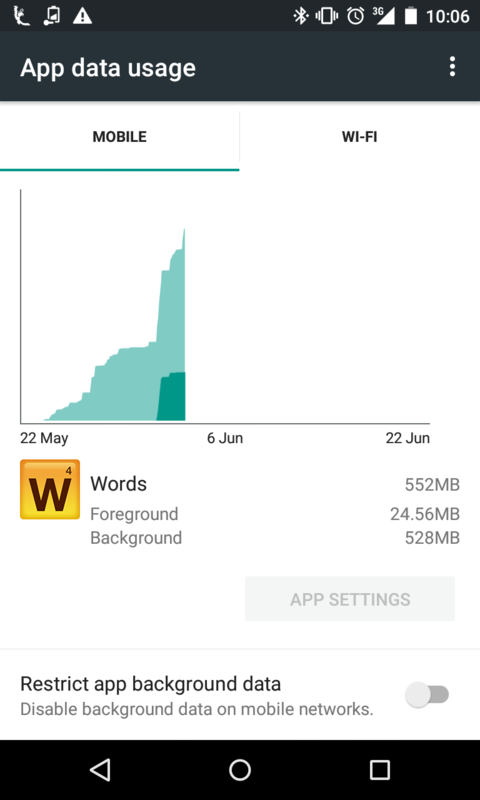 According to my android phone Words with Friends used 500MB in what looks like a single day. That is outrageous. How is it even possible that this game used that much data? Is it downloading the ads? Could someone please investigate how this is possible? I don't want to uninstall the game but if it is going to use 500MB of mobile data at any point then I can't keep it around. I don't have the smallest data plan but that is still excessive. Thanks for bringing this up, miked314. This may be due to the features that we're constantly adding in the game. You may try clearing its cache to improve its performance. You'll find it under the App info from your device settings. Here's a screenshot for your reference. Note: Please don't tap on the Clear Data button as this may wipe out your login info. Thanks for your reply Sofia but I'm honestly still confused by this. Are you saying that Words with Friends applies application updates outside of the normal Google Play Store channels? Regardless that still seems like a very excessive amount of data to use. Even a couple hundred MB would be understandable (though in one day it would still be annoying) but HALF A GIGABYTE? I don't know of many phone plans where that wouldn't be a significant portion of your allocated data for the month. It is 1/8th of what I get for 30 days gone in a single day for an application I don't care that much about. I enjoy playing this game with my family back home since I don't get to see them that much anymore but I can't have my data wasted like this. Using a half a gig of data to download ads or something is just unacceptable. Appreciate the feedback, @miked314. I'll do my best to relay your concern to the team. In the meantime, you may still clear the game's cache to improve its performance. Hello Mike @mike314. Your data usage will always be affected by games and Words (and others) use a lot. If you have a Wi-Fi connection I would suggest using that whenever possible as it will not eat up your monthly data from your service provider. I get that apps will use data but 500MB in a day for a game where you put letters on a grid seems excessive. I still don't understand what it could have been doing. 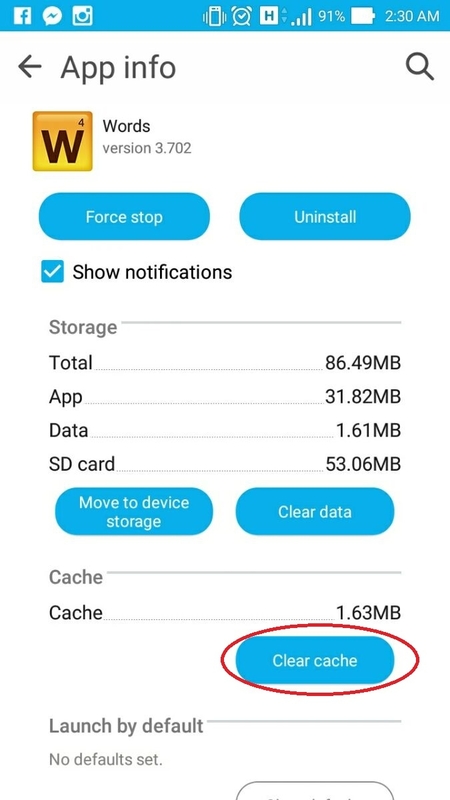 The whole installed app+data+cache is less than 150MB so an application update doesn't really make sense. I've paid for no ads so I doubt it would be downloading ad content. That would be a lot of ad content anyway. If it is downloading the ads even though I paid not to see them then I hope the developers could fix that sometime. Chats are only text and I don't talk nearly that much. Throw some validation fields and some other data on top and it still doesn't ad up to 500MB in a day. I can stream a half hour show on Netflix at medium quality and use less data than that. Anyway, who says my home internet isn't metered too? Regardless of that it just seemed strange that this game chewed up so much data so fast. I just checked and it hasn't done this again in the last 3 months which is as far back as I can look since I got a new phone. So maybe it was just a random fluke. It's apparently not a random fluke. I just got an AT&T data usage bill for $160 after I used Words2 for about 2 hours a day for 4 days while I was bedridden. This is ridiculous! I tried accessing the info previous in this post chain to clear cache but in my app settings for words2 I have only location, siri & search, background app refresh [on/off] and cellular data [on/off]. Anyone have and ideas? Please advise or I will have to uninstall Words. Please clarify directions to minimize data usage. I only play WWF on wifi and I went way over my usage this month. I am using an iPhone 6. Thank you for your assistance. @njcurtiss On my iPhone 6 under settings, I scroll down to the WWF app and select it, then I turn off the Cellular Data item. That works for me. If I am not connected to WiFi the WWF will not app will not connect and will state "No Connection". If your WiFi signal drops off or is not strong enough I've read that it will automatically switch to use Cellular Data. Hope that helps. If there other apps you use you might want to turn that off for them as well just in case but be careful.